Case made binders and slipcase. Disney needed a way to collect and store information that would be readily available at a moments notice. 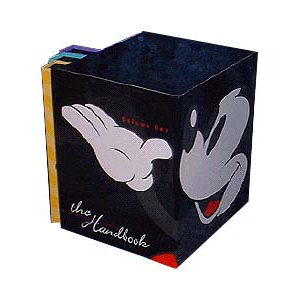 Storage would be at the front desk of the Disney Store so it was critical that the case and binders be attractive, reflect the decor of the store and yet still be durable. Laminated materials are durable and easy to keep clean, and the slipcase keeps all information together. Fun graphics were used to represent Disney culture.